Even the best policies still need to be communicated well in order to be effective. But what’s the best way to tell a story and make it part of the public conversation? 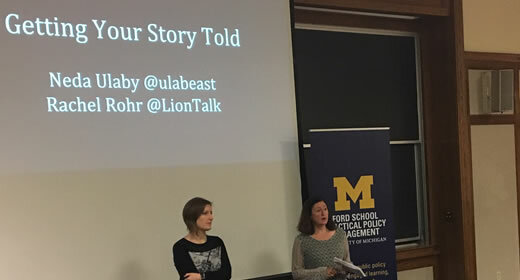 Getting Stuff Done: Communications Skills Series is aimed at helping Ford School students at all levels effectively tell their stories and make the most of traditional and new media. The series — organized by the Program for Practical Policy Engagement (P3E), Ford School Communication and Outreach, Public Engagement & Impact, and Michigan News — features top experts in the media and communications fields. “The best ideas still need a communications plan to build awareness and catch on. This is uniquely true for public policy, where ideas are often shared and vetted through various forms of the media,” says Cindy Bank, director of P3E. The next session, “Getting the Media on Your Side,” will be held Feb. 22, 11:30 a.m.-1 p.m. in Weill Hall and will feature Mandira Banerjee and Fernanda Pires, who bring extensive experience in journalism, media training, and public relations. In January’s workshop, Neda Ulaby of National Public Radio and Rachel Rohr, managing editor of the GroundTruth Project, showed students effective ways to tell stories and interact with the media. Kari Rea, MPP ’20, said she attended the January workshop to hear directly from experts on communication strategies. Sessions in March and April will focus on writing and pitching op-eds, and using social media the right way. The Practical Policy Engagement Program (P3E) is a university–wide resource housed at the Ford School where it can leverage existing expertise and interdisciplinary approaches to generate policy–relevant research, analysis and learning, as well as improvements in organizational practice.